In Chiapas, the rural southwest state in Mexico, issues surrounding migration are a little different than what we hear about on the news. Communities aren’t controlled by gangs. You don’t witness acts of violence on the streets, and you cannot assume that pretty much everyone could have a potential asylum case. These largely indigenous communities are defined by poverty. Rather, poverty for the indigenous people of these communities is the result of a crushing, systemic problem with its roots in decades of injustice and exploitation, beginning with the “encomienda” system under Spanish rule. In the early days of Spanish conquest of the New World, the granting of encomiendas was a way to reward Spanish subjects for loyalty through grants of land – and the peoples who inhabited that land. In this way, the Spanish crown ensured the subordination of the indigenous peoples. The ensuing “hacienda” system, similar to share-cropping, also dates to the colonial period and continued well into the 20th century. Wealthy landowners, often from another country, held large tracts of land and used the local resident population as workers. The landowners profited while the peasants struggled to survive. Today, the rancheros are gone, and the land is mostly owned by the peasant workers. Under the hacienda system, large families were needed to produce more workers. But as the land came under the ownership of the peasants themselves, large families quickly became a liability. There simply wasn’t enough land to divide among the sons or to produce enough food to sustain the family. Today, subsistence farming is the norm, and families must buy or rent additional land to get by. However, buying or renting land takes cash, and little cash is generated in these communities. Migration has become an economic necessity in Chiapas and other rural parts of Mexico and Central America. Farmers grow corn and beans and raise chickens, turkeys, sheep and pigs. With few opportunities to generate income, young men and boys are forced to leave home to work in “el norte” (northern Mexico or the U.S.). They leave once crops are harvested and return in time for planting when the spring rains begin. The minimum wage in Mexico is between $4 and $5 per day, and the income they generate allows the family to rent or purchase enough land to sustain the family. Eventually, they hope to purchase enough land to sustain their own families. Manuel is a pastor and comes from a large family of Christian believers. “We were all sons,” he said, all in line to receive a portion of his dad’s property. “There were too many of us and not enough land,” he said, laughing. They are forced to rent land in order to feed and raise their children. Manuel’s two youngest brothers are in the United States. “They made the decision to leave home and send money back, so that we can continue to farm and support our families,” he explained. The hope is that they will be able to purchase more land, and that one day the brothers can return. “Maybe this year they’ll come back. But they say the same thing every year,” Manuel said sadly. It’s a Monday morning. A soft rain falls, roosters crow, turkeys gobble and dogs look for dry spots to curl up and sleep. It’s cool, muddy and miserable, and the trek to the tin-enclosed outhouse is down a steep hill. There’s no running water, and the kitchen is a dirt-floor shed, where food is cooked over an open fire. We spent the morning presenting details of a community development project to be managed by Manuel and Fausto, another local pastor. But the church has gathered, and no one wants to miss an opportunity for worship. 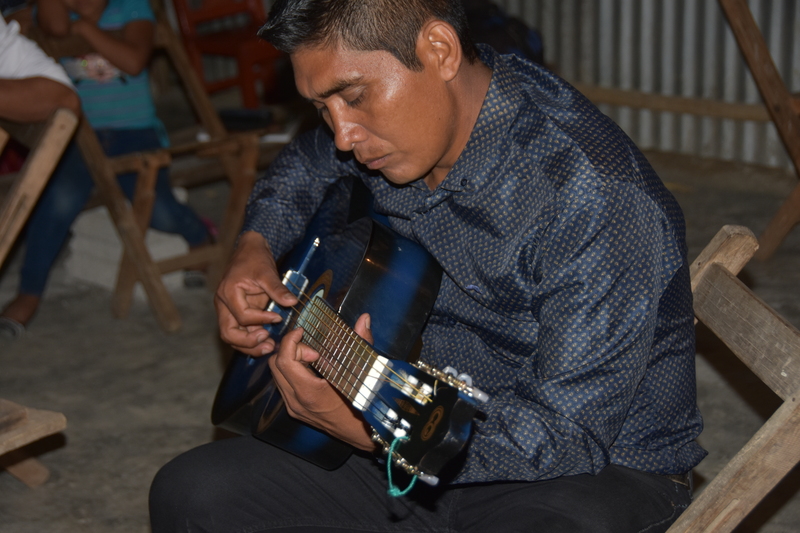 Manuel and his older brother grab their guitars and begin to play and sing in clear, strong voices and in beautiful harmony, “Que Lindo es mi Cristo” (“How Beautiful is my Christ”), a song by Marcus Witt. These are communities where people feel powerless to change their circumstances and where many lose hope. But suddenly, the community doesn’t feel so hopeless anymore.